Last night Momma Warrick and I (and a few hundred "friends") enjoyed listening to the great songs of the legendary Carole King! What a fun evening - we enjoyed dinner & drinks before the show, which was at the Schuster Center in downtown Dayton. Talk about a dream come true. Mom and I have always said we would do anything to see her perform live in concert. So when Mom's company, Kettering Medical Center, announced that Carole King would be performing at the annual Heart to Heart Gala, well we just had to attend! Now, more on Carole. I say Carole like she is a close, personal friend of mine. It simply goes to show how connected fans feel to her through her music. I was not the only one referring to her on a first name basis last night. 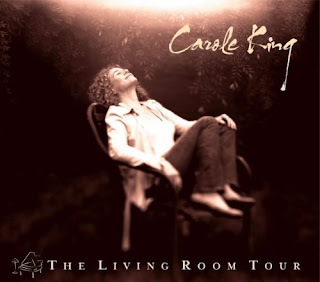 Her latest tour, called The Living Room Tour, reflects how much she understand the closeness people feel when her music is played. 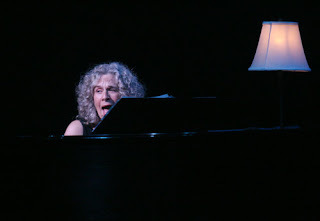 Carole King looked absolutely fabulous - dressed in a simple elegant black V-neck dress, with strapy, sparkly shoes. Curly shoulder length signature hair, though more grey than blonde in color now. Those curls bounced every time she hit those piano keys, you could tell how much she truly loved the music she was playing. She looked so natural behind that baby grand piano, playing all her hits. She opened with the song "Beautiful" and treated us to so many other treasured songs. "So Far Away", "You've Got A Friend", "Where You Lead", and many others. Carole also surprised some of us by stepping out in front of the piano, picking up a guitar and strumming away on the great song, "Smackwater Jack". Several times throughout the night, I closed my eyes, listened to her singing some of my favorite songs, and really tried to absorb the moment. What a treat - Carole King live in concert - Thanks for the ticket Mom!!! Here is a professional review of the concert from the Dayton Daily News. We were lucky enough to have our power restored on Wednesday evening. Lots of people in the Tri-State are still without power and it really might be into the weekend before it's restored in some communities. * the toaster - nothing like a hot piece of toast with butter & jelly. * the fridge/freezer - for obvious reasons. * a hair dryer - especially when you have natural wavy/frizzy hair. * the alarm clock - i enjoy waking to the radio tunes, not the annoying beeping of my cell phone. * the lights in the bathroom - no comment needed. THANK YOU to the hard working Duke Energy crews who have restored the power in my neighborhood. I now live with a better appreciation of electricity and the power it has in our lives! If you're reading and still without power - I truly hope you get it soon. Call if you need anything! The effects of Hurricane Ike in the Cincinnati area are crazy! Nothing like what the Texas cities and other areas of the southern U.S. are facing, but I'd say everyone here was a bit surprised and caught off guard when those strong winds rolled in Sunday afternoon, knocking out power to hundreds of thousands of people. Trees uprooted from the ground, split branches and tons of debris to clean up in the coming days. Some rumors going around say it might be the weekend before the power gets restored to most of the Queen City. So, we wait. I am thankful to have a gas water heater (I can still take a hot shower, just can't blow dry my hair) and a gas stove (I can still make the ol' standby for dinner, spaghetti). Luckily I hadn't made it to the store for the monthly fill up on grocery's that would be going bad; like my daily breakfast of strawberry or peach yogurt, or lots of meat to stock up on in the freezer, or fresh turkey from the deli for sandwiches, so it's not like my fridge/freezer was filled with food - Thankfully. All in all, I'd say it's not so bad for us. We've been getting creative with how we spend our time since there's no electricity in St. B. We go to the park and "play" soccer (actually JJ plays, I just kick the ball back to him!). We've been watching TV shows & movies on the computer rather than the television. We cooked a frozen pizza on the grill for dinner last night - quite tasty given the circumstances! If you're a reader who's lost power, I hope life it's too bad for you & that life gets back to normal soon for all of us! 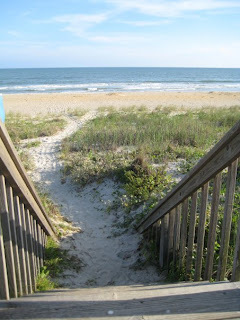 Below is the glorious view of the Atlantic Ocean from the deck steps down to Holden Beach. I have already posted about what a special place Holden Beach is, a relaxing retreat where life's hardest decisions come down to things like - Which book to read in the afternoon? Do I want to "boogie board" or "body surf" the waves? Should we grill out or jaunt over to the Provision Company restaurant for some fresh seafood for dinner? Do I feel like having a Corona w/ a lime at 2pm out on the sun deck, just because I can?!? 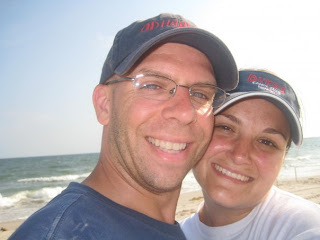 It's a place where commercialized super stores and giant hotel chains haven't made there way into town to crowd up the one bridge that takes you across the inland waterway to access all the beautiful beachfront homes. There's not even a Starbucks, which could be looked at as a bummer, however there is an awesome locally owned and operated java joint called "Cappuccino By the Sea" - full of treasured trinkets and tasty flavored lattes. So ready to unwind and relax in my "low rider" beach chair with my feet nestled in the sand. So ready to play all those "beach" tunes I'd loaded onto my iPod. So ready to watch the sunrise over the east end of the island. What I didn't know is that I was So ready to make the biggest decision of my life. While watching those beautiful rays of sun pop through the clouds, loving every minute of this remarkable moment, feeling the sun hit my smiling face - IT was happening...JJ down on one knee asking me to marry him. Tears of happiness & excitement overwhelmed both of us as we made the biggest decision of our lives...to spend it together...forever. Last month we attend the Panegyri Greek festival here in Cincinnati and had some awesome Greek food...tasty kabobs, an antipasto platter with yummy cheese and olives (none for me though), and a really tasty "Greek pizza". Here is the after picture...baked it on a pizza stone and turned out to be one of that best pizza's we've ever made. Making the whole thing even better, was enjoying the afternoon on the back patio relaxing! !